Core training is one of the most overused and often misused phrases in the fitness world today. In my experience the average exercise enthusiast mistakenly believes that core training means doing crunches until your back hurts and abs cramp. If you’ve ever experienced back soreness from doing countless repetitions of trunk flexion exercises like crunches, sit-ups or oblique twists then it might be a little disheartening to know that you’re probably overlooking one of the most effective exercises for strengthening your core muscles: the humble plank. The common misconception is that doing crunches or similar trunk flexion exercises can help eliminate layers of tummy fat. However, doing crunches or sit-ups in the hopes of burning fat is like trying to walk up the down escalator, it just isn’t that efficient. While doing exercises like crunches, oblique twists and side bends can help make stomach muscles a little stronger, the harsh reality is that they most likely won’t expend enough energy to get rid of love handles and they don’t actually strengthen the muscles responsible for creating the appearance of a flat tummy. The best way to eliminate excess body-fat is doing aerobic exercises, which can be achieved by doing twenty-to-thirty reps (in a row) of your favorite Total Gym exercises. Simply put, your body stores excess energy (from the food you consume) as fat. Getting rid of unwanted body fat means increasing your overall levels of physical activity while making healthier nutrition choices and reducing caloric intake. If you’re looking for the quickest way to develop strong, flat core muscles then your focus should be on doing a number of different variations of the plank. To help you understand why planking is so beneficial it’s important to have a little insight into how your core muscles are actually designed to function. The muscles and skeletal structures of the human body are designed to work when you are standing upright on the ground, not lying on the floor. Think about it, the human body is designed to move and humans are bipedal (we use two legs to walk). Your skeleton and muscles are organized in such a way to harness energy from gravity as you’re moving on the ground, not when you’re lying on it, (for a detailed explanation you can see my article on the function of your abdominal muscles here). 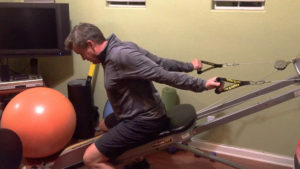 Canadian researcher Dr. Stuart McGill has spent years studying the biomechanics of the human spine and has found that exercises which create stiffness in multiple directions can help strengthen the core better than exercises involving spinal flexion. Effective core exercises use the muscles of the hips, thighs, shoulders and arms while the spine remains in a straight, extended position making the plank one of the better movements for getting results. Here are 10 benefits of making the high plank a foundational component of your workout program, as well as a video demonstrating a few options for doing the plank both on and off of the Total Gym. Holding a high plank may not only be more comfortable for your back, but can be extremely effective for strengthening the muscles responsible for stabilizing your spine and giving the appearance of a flat stomach. A high plank, holding your body at the top of a push-up, uses the muscles of the shoulders, arms, hips, thighs and core to work together to create and maintain stability. Gripping the ground with your hands and pushing your back into your shoulder blades while performing the high plank can help strengthen the upper back muscles which can become weak if you live a sedentary lifestyle. The plank strengthens the transverse abdominus (TVA), a horizontal band of muscle that wraps around your mid-section like a corset. As it gets stronger, it can help give the appearance of a flat stomach. Besides creating a flatter stomach, strengthening the TVA can help improve your posture which can make you appear a little taller. Because it places relatively little physical pressure on the spine and uses endurance-oriented muscle fibers you can do the high plank in almost every workout. If you’re a runner and like exercising outside the high plank is a great way to strengthen your core without having to lie down on the ground. Incorporating subtle movements like moving the arms forward and back or bringing your knees closer to your chest can increase the level of difficulty without placing too much stress on your spine. Improving your strength in the high plank can help you maintain a stable spine while performing resistance training exercises like the Romanian deadlift, squat, bent-over row and standing overhead press. If you’re a runner, the high plank can help strengthen your postural muscles and enhance stability in the pelvis allowing you to put more force into the ground with each stride. Hold a high plank for as long as you can with the goal of working up to being able to maintain the position for at least 45 seconds; rest 30-45 seconds and repeat for up to 5 sets. 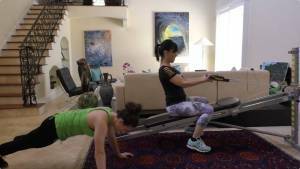 Set your Total Gym on a lower angle, remove the cables from the glide board, hold on to the glide board while not allowing it to move; hold for 30-45 seconds and repeat for up to 5 sets. Place your hands on the ground and feet on the glide board, bring your knees closer to your chest then extend your legs. Work up to 12-15 reps; rest for 30-45 seconds and repeat for up to 5 sets. Complete all sets of an exercise before moving on to the next exercise. These can be performed either as a warm-up or as part of the workout. Lying on the ground to do three sets of abdominal and oblique crunches will not adequately train core muscles to accommodate the multi-planar forces your body will experience throughout the day. Just like a computer has a default operating system for running software programs; the default operating system of human movement is the pattern of walking or running. Core training programs should emphasize strength of the stabilizer muscles because they support the efficient transfer of forces from the ground to the rest of the body. The core muscles work most efficiently while the body is in a standing position; high planks can help you develop a strong, stable spine to improve your movement while flattening your stomach making them a true win-win exercise. Pete McCall is an educator, performance coach, personal trainer, author, consultant and host of the All About Fitness podcast. Based in San Diego, CA, Pete holds a master’s degree in exercise science and health promotion, completed a Fellowship in Applied Functional Science with the Gray Institute, is a Certified Personal Trainer and a Certified Strength and Conditioning Specialist. Currently Pete is an adjunct faculty in exercise science at Mesa College, a master trainer for Core Health and Fitness, a blogger and content contributor for the American Council on Exercise (ACE) and online instructor for the National Academy of Sports Medicine (NASM). Consulting with organizations like the World Bank, Reebok, 24-Hour Fitness, Core Health & Fitness, the Institute of Motion and Fit Pro, Pete has experience identifying needs and delivering solutions. Frequently quoted as a fitness expert in publications such as The New York Times, Washington Post, U-T San Diego, SELF, Glamour, and Shape Magazine and featured as a fitness expert for TV news outlets including WRC-NBC (DC), Fox News, Fox 5 San Diego, and NBC7 San Diego, Pete is a sought-after media resource for accurate, in-depth insight on how to get results from exercise.